Pennsylvania has a rich architectural history that reflects the broad patterns of settlement, growth and change across the sixty-seven counties of the state. While no standing buildings remain of Native American construction, some buildings from the earliest day of European settlement have survived. Historic structures from all eras are present in Pennsylvania, but since the state saw its greatest development in the late 19th and early to mid-20th century, buildings from this period are more plentiful. This website offers information on common historic building types and architectural styles from the 1700s through 1960s in our state. Additional information about historic architectural styles and building types can be found on the PHMC's other webpages concerning historic agricultual resources, historic schools and historic suburbs including the post World War II building boom. Pennsylvania has examples of a wide variety of regional and national architectural styles, spanning not just the eras, but also showing a broad range of design purity. Some buildings are high style, architect-designed, pure examples of distinct styles, but most are more vernacular in design, a blend of styles and cultural influences. The historic buildings of Pennsylvania encompass many themes from government, education, agriculture and industry to religion, recreation and commerce. Some architectural styles were modified for specific functions and some styles developed specifically for special uses. This guide to architectural styles commonly found in Pennsylvania includes examples of residences, churches, theaters, schools, railroad stations, banks, taverns, hotels, commercial buildings, government offices and farm complexes. These examples provide some hint of the depth and breadth of Pennsylvania's architectural heritage. This guide is intended to help those interested in historic buildings to better understand and evaluate commonly seen properties in our state. The form, massing and architectural details can help to place a building within a certain time context and offer clues as to its use and origin. 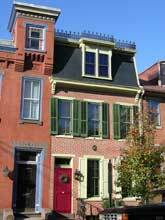 All of the architectural styles included in this guide are well represented in PA. Many of the styles presented here can be seen throughout the state, the country, and beyond, as some stylistic trends crossed national boundaries. Some styles and building types are unique to Pennsylvania or the Mid--Atlantic region. Those are perhaps the most interesting in that they reflect a strong vernacular tradition and have close ties to those who first settled the state. The styles are listed in approximate chronological order beginning with those found in the earliest settlement period and ending with those popular in the mid-20th century. Generally, since the European settlement of Pennsylvania began in the mid 1600s in the southeast corner of the state, the earliest buildings are of course, found in this region. The Swedes and the English were the first to arrive and settle along the mouth of the Delaware River, bringing their own building traditions. The log cabin form in America is attributed to the Swedes, although its use was adopted by many other nationalities and it became prevalent throughout the state and beyond. The Germans especially first built log homes and barns as they settled into Pennsylvania, often incorporating them into larger, more formal homes over time. The English brought with them the Georgian style of simple symmetry with classical form and details. The southeastern corner of the state is perhaps best known for its collection of 18th and 19th century stone houses, taverns and farm complexes, often of Georgian or later Federal design. While similar buildings can be found elsewhere in the state, this region is especially rich in this type of historic resource. The large wave of German settlers arriving in Pennsylvania throughout the 1700s and early 1800s brought a new cultural tradition. This Germanic influence could be seen in a unique house form that developed in Pennsylvania, the Pennsylvania German Double Door or Four Bay House, theorized to be a blend of English symmetry and traditional German form and plan. The German settlers also brought with them traditional designs for agricultural buildings. The Pennsylvania Bank Barn, built into a hillside to provide access to both upper and lower levels, with a pronounced forebay or overhang is one such distinctive building type. While the German influence is most evident in the counties west and north of the Philadelphia area where settlement first occurred, these building practices can be seen in the Susquehanna Valley region and across the state. The cultural impact of German immigration was significant with one third of the state’s population being of German ancestry by the time of the American Revolution. The Northern Tier of Pennsylvania was influenced not just by settlers moving north and west from the Philadelphia region, but also by settlers moving south and west from earlier settlements in Connecticut and New York. For some time the state's northern boundary was contested by Connecticut, as both states vied for ownership rights to the land. Consequently, this area of the state has a different cultural influence. The Greek Revival Style associated with settlers from New England is much evident in the Northern Tier of the state. Later waves of emigration brought some distinctly different architectural elements as well. Eastern Europeans brought traditional Orthodox religious architecture with them to their new neighborhoods. The onion dome churches of the coal and steel industry communities are a testament to the ethnic origins of the residents. While housing in these areas reflects the more common styles of the day, as adapted to working class residences, the churches and social clubs show a far more distinctive ethnic cultural influence. Other later architectural styles from the mid 1800s on, spread outward from urban centers like Philadelphia, New York and Pittsburgh to the rural regions of the state, with the design often becoming less formal and more vernacular as the concepts evolved over distance and time. Remote regions clung to traditional building forms, long after newer designs were commonly embraced. Thus, the study of historic buildings and architectural styles must acknowledge the variable nature of the subject matter. Many buildings show a variety of stylistic influences and resist easy classification. Other buildings might begin as pure examples of one style, but sustain modifications over time to incorporate other stylistic elements. This complexity of form adds to the richness of Pennsylvania's architectural heritage and reflects the state's multitude of cultural influences, but it can make the easy identification of a building's style and or period more difficult to determine. Pennsylvania's history is all around us in our built environment. Architectural clues help us better understand the historic context of our communities. Greater awareness and appreciation of our state's architectural heritage will allow us to better preserve the very best elements our past.